The following are notes included on the Adoption Profile and Booklet templates. We have duplicated these notes here as an additional resource to this information. There are many page designs to choose from. Select a page design from the Page Styles tab (located below your page) or design your own. To change a page’s design, scroll through the Page Styles tab to select one. Then drag and drop it onto your page. Red Trim Line: The red line that borders each page indicates where your page will be cut. Bleed Area: This is the area outside the red line and will be cut off. Extending images into the bleed area allows us to print your piece on oversized paper and then trim it down to the exact size. This method achieves a finished, professional appearance to your piece. 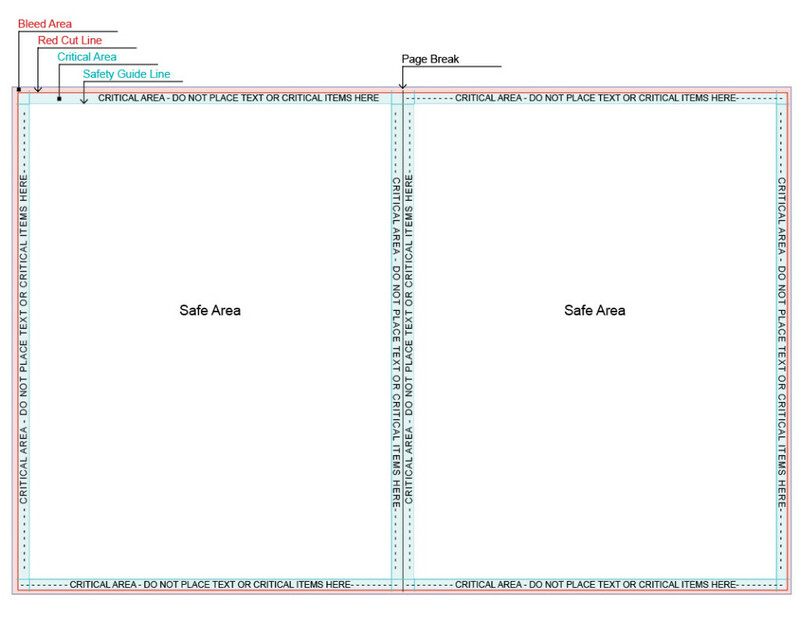 Safe Area / Light Blue Safety Guide: The area inside the light blue guide lines is Live Area or Safe Area. Critical elements and text should be positioned inside the live/safe area to prevent those items from being trimmed into / cut off when the page is trimmed to size. 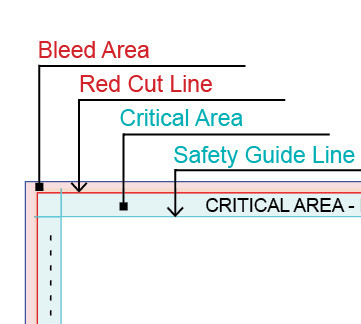 Critical Area: The area between the Red (cut line) and Light Blue guide line is the critical area. We recommend that no type or critical items are placed in this area. Click the ‘Preview’ button located above your page to view your project without guidelines and bleed area showing. If you would like to edit your project without safety guidelines showing, from the top menu select View > Guides > Hide Guides. To turn them back on select View > Guides > Show Guides. Need single cut (loose) pages? This project can be ordered as one or two-sided loose pages instead of a booklet. See www.focusinpix.com/booklet-photo-book-pricing to learn more about this option. (Shown on page 2 of your project) This page is the back side of the front cover. It will be printed on 100 lb. cover weight card stock. (Shown on the second-to-last page of your project) This page is the back side of the back cover. It will be printed on 100 lb. cover weight card stock. Your pages are printed on large sheets of paper, 4 pages to each large sheet with 2 pages on one side and 2 pages on the other. Once all the pages have been printed on the large sheets, they are professionally folded, bound with staples and trimmed. — For the booklet product, the minimum page count is 8 pages and the maximum page count is 60 pages. — For the brochure product, the total page count is always 4 pages (no more, no less). If you need more pages, change to our booklet product. If you would like less pages (for single cut pages), you may want to consider using our scrapbook pages product instead. If you are having trouble getting your page count to be divisible by 4, we recommend adding blank pages. The most popular place to place blank pages are the inside front cover (page 2), the inside back cover, and the back cover. Blank pages can be white or with a coordinating background pattern from the Backgrounds tab. If you don’t like the idea of a blank page, we recommend filling the extra page(s) with one or a collage of pictures. During ordering, you can opt for single cut (loose) pages instead of a booklet. Even when opting to convert your project to single pages, the page count still must be divisible by 4. If there are extra pages in your project that you do not want printed, feel free to send us a message at production@focusinpix.com (or fill out the form below). Note: there is no price adjustment for not printing extra pages. PAGES CAN ONLY BE ADDED OR DELETED IN SETS OF TWO. Because 2-page spreads cannot easily be separated after they have already been designed, we suggest taking sufficient time to pre-plan what to put on each of your pages before you start to design your booklet. Some graphics in our templates have been created using a special font style. If a special font style was used in the template, the name of the font will be noted in the template. In some cases, the color of these graphics can be changed, however they cannot be edited with different characters since they have been converted from text to a graphic. If you are looking for different verbiage, additional text graphics made with the same font can be found in our Scrapbook tab. If you do not find what you need, alternatively you may want to search online to download and/or purchase this font so it can be installed on your computer. Once installed, reopen your project so you can make your own custom text headings. We offer a PROOF PDF (free) and a SHAREABLE PDF ($25). When proofing your profile, select File > Create Proofs… from the top menu to make a PROOF PDF. This will be lower resolution with watermarking. DRAFT PDF: Create a Draft PDF by selecting File > Create Proofs from top menu. This PDF will show “Proof Draft Only” watermarked on pages. FINAL PDF: A watermark-free, Shareable PDF can be purchased only when ordering printing of your profile. The Shareable PDF will not allow printing or editing and is intended for on-screen viewing only. If a PDF is requested by your adoption representative, we suggest ordering this option after your Draft PDF has been approved by your agency or representative. ONLINE SHARING: With every order, there is a free, online version (non-PDF) of your project that can be shared after placing your order and uploading your project. To share your ordered project, log into your account at www.focusinpix.com (click on ‘My Account’ near top of page to log in). Need a Hard Cover Book? This product will make a softcover, fold-and-staple booklet, not a hard cover book. To make a hard cover book. close this project and begin a new one by selecting from our Photo Books category. If you do not see category Photo Books, you must add Photo Books to your software. Click ‘Create a New Project’. When the dialog box appears, click the ‘Check for Updates’ button to install Photo Book products to your software. We recommend trying Photo Books: Portrait, 8.5 x 11 as it is similar to this product style. If you have additional questions about Adoption Profiles and Booklets, feel free to contact us! Click here to fill out our web contact form, or send us an email at production@focusinpix.com.